CSR Promotion in the Supply Chain | Supply Chain Responsibility | CSR | MURATEC,MURATA MACHINERY, LTD. The Murata Machinery Group promotes CSR activities together with our business partners in order to fulfill our social responsibilities in terms of human rights, labor and environmental conservation. Since FY2015, we have surveyed the CSR activity efforts on the part of the major suppliers of our Clean FA Division based on the EICC Code of Conduct(*). Specifically, we surveyed 1.Understanding of EICC Code of Conduct, 2.Labor, 3.Health & Safety, 4.Environment, 5.Ethics, 6.Management systems and 7.business continuity plans (BCP) with the help of our business partners. *Click here to visit the EICC website. 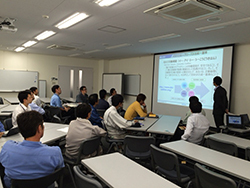 Since FY2015, we have held CSR seminars in Ise / Inuyama Plant for the part of the major suppliers of our Clean FA Division. Muratec will continue to promote and spread CSR in the Muratec supply-chain to help our business partners further promote their own CSR activities.